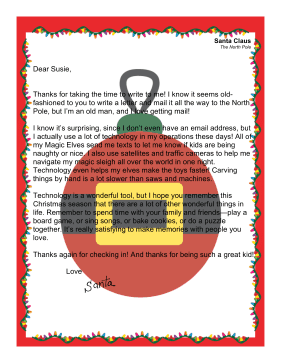 Santa updates his image with regards to technology and surveillance in this letter to children. Thanks for taking the time to write to me! I know it seems old-fashioned to you to write a letter and mail it all the way to the North Pole, but I'm an old man, and I love getting mail! I know it's surprising, since I don't even have an email address, but I actually use a lot of technology in my operations these days! All of my Magic Elves send me texts to let me know if kids are being naughty or nice. I also use satellites and traffic cameras to help me navigate my magic sleigh all over the world in one night. Technology even helps my elves make the toys faster! Carving things by hand is a lot slower than saws and machines. Technology is a wonderful tool, but I hope you remember this Christmas season that there are a lot of other wonderful things in life. Remember to spend time with your family and friends—play a board game, or sing songs, or bake cookies, or do a puzzle together. It's really satisfying to make memories with people you love. Thanks again for checking in! And thanks for being such a great kid!